Independent security informational portal and antivirus software testing group Virus Bulletin have released the results of their latest round of VB100 certification tests. We’re delighted to report that Emsisoft Anti-Malware has once again achieved a perfect score and successfully earned certification! What is the VB100 all about? The VB100 is a certification system with a history spanning 20 years. Essentially, it reveals whether an antivirus product can perform the core function of identifying threats without generating false positives. The WildList set: a set of malware samples that have been recently observed in the wild by researchers and collected by the WildList Organization. The Real-Time Threat List: a continuous feed of new malware samples collected by experts and managed by the Anti-Malware Testing Standards Organization. The Diversity set: a set of recently seen malware collected by Virus Bulletin. The antivirus products also scanned a clean set of about 100,000 non-malicious files taken from popular software downloads. The tests were repeated three times over the course of a few days, using the same set of samples each time. Internet access was allowed throughout the testing period. To achieve VB100 certification, a product had to detect at least 99.5 percent of the malware samples and generate fewer than 0.01 percent false positives. 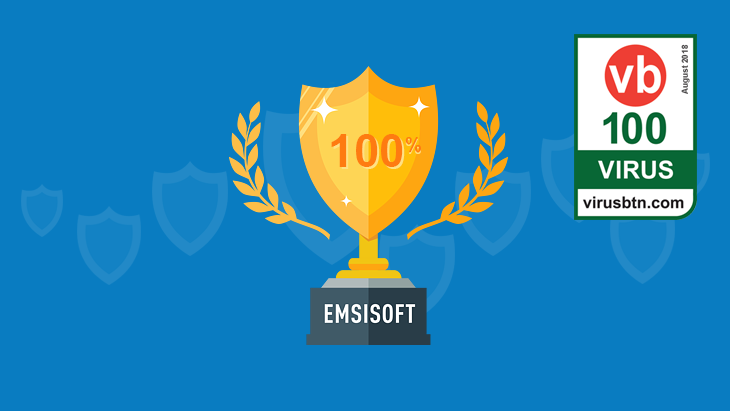 We’re proud to announce that Emsisoft Anti-Malware achieved a perfect score, detecting 100 percent of the 990 malware samples involved in testing and generating 0 false positives. Emsisoft Anti-Malware also scored a 100 percent detection rate in the supplementary Diversity Test, which is not part of the certification criteria. We’re not in it for the accolades, but we are proud to see our software performing so well in a testing environment. We’ll continue working on providing the best antivirus software possible to protect our customers against both known and emerging digital threats. You can check out some of the other security awards we’ve won in the past here. Headquartered in the UK, Virus Bulletin is an independent IT software testing group that provides consumers with valuable information about antivirus products. A product that earns VB100 certification can be considered to have met a certain standard of quality and can generally be trusted to provide a reasonable level of malware protection.